Os genes podem ser egoistas? 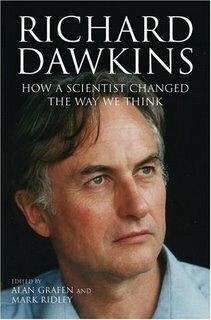 A Oxford University Press acaba de lançar uma colectânea de ensaios sobre a obra de Richard Dawkins, assinalando o trigésimo aniversário de O Gene Egoista. Deixo-vos aqui um longo excerto do ensaio de Steven Pinker, professor de psicologia da Universidade de Harvard (ver o texto completo no jornal The Times, de 4 de Março de 2006). Terá a metáfora de Dawkins ido longe demais? Pessoalmente, nunca gostei da metáfora do gene egoista i) pela valoração moral negativa que ela encerra e ii) pela importância desmesurada que atribui ao gene. E, no entanto… que me dizem da metáfora quando iluminada pela mente de Pinker? “I sometimes wonder, though, whether caveats about the use of mentalistic vocabulary in biology are stronger than they need to be — whether there is an abstract sense in which we can literally say that genes are selfish, that they try to replicate, that they know about their past environments, and so on. Now of course we have no reason to believe that genes have conscious experience, but a dirty secret of modern science is that we have no way of explaining the fact that humans have conscious experience either (conscious experience in the sense of raw first-person subjective awareness — the distinction between conscious and unconscious processes, and the nature of self-consciousness, are entirely tractable scientific topics). No one has really explained why it feels like something to be a hunk of neural tissue processing information in certain complex patterns. So even in the case of humans, our use of mentalistic terms does not depend on a commitment on how to explain the subjective aspects of the relevant states, but only on their functional role within a chain of computations. Taking this to its logical conclusion, it seems to me that if information-processing gives us a good explanation for the states of knowing and wanting that are embodied in the hunk of matter called a human brain, there is no principled reason to avoid attributing states of knowing and wanting to other hunks of matter. To be specific, nothing prevents us from seeking a generic characterisation of “knowing” (in terms of the storage of usable information) that would embrace both the way in which people know things (in their case, in the patterns of synaptic connectivity in brain tissue) and the ways in which the genes know things (presumably in the sequence of bases in their DNA). Similarly, we could frame an abstract characterisation of “trying” in terms of negative feedback loops, that is, a causal nexus consisting of repeated or continuous operations, a mechanism that is sensitive to the effects of those operations on some state of the environment, and an adjustment process that alters the operation on the next iteration in a direction, thereby increasing the chance that that aspect of the environment will be caused to be in a given state. In the case of the human mind, the actions would be muscle movements, the effects would be detected by the senses, and the adjustments would be made by neural circuitry programming the next iteration of the movement. In the case of the evolution of genes, the actions would be extended phenotypes, the effects would be sensed as differential mortality and fecundity, and the adjustment would be made in terms of the number of descendants resulting in the next generation. This characterisation of beliefs and desires in terms of information rather than physical incarnation may overarch not only life and mind but other intelligent systems such as machines and societies. By the same token it would embrace the various forms of intelligence implicit in the bodies of animals and plants, which we would not want to attribute either to fully human cogitation nor to the monomaniacal agenda of replication characterising the genes. When the coloration of a viceroy butterfly fools the butterfly’s predators by mimicking that of a more noxious monarch butterfly, there is a kind of intelligence being manifest. But its immediate goal is to fool the predator rather than replicate the genes, and its proximate mechanism is the overall developmental plan of the organism rather than the transcription of a single gene. In other words the attribution of mentalistic states such as knowing and trying can be hierarchical. The genes, in order to effect their goal of making copies of themselves, can help to build an organ whose goal is to fool a predator. The human mind is another intelligent mechanism built as part of the intelligent agenda of the genes, and it is the seat of a third (and the most familiar) level of intelligence: the internal simulation of possible behaviours and their anticipated consequences that makes our intelligence more flexible and powerful than the limited forms implicit in the genes or in the bodies of plants and animals. Inside the mind, too, we find a hierarchy of sub-goals (to make a cup of coffee, put coffee grounds in the coffeemaker; to get coffee grounds, grind the beans; to get the beans, find the package; if there is no package, go to the store; and so on). Computer scientists often visualise hierarchies of goals as a stack, in which a program designed to achieve some goal often has to accomplish a sub-goal as a means to its end, whereupon it “pushes down” to an appropriate sub-routine, and then “pops” back up when the sub-routine has accomplished the sub-goal. The sub-routine, in turn, can call a sub-routine of its own to accomplish an even smaller and more specialised sub-goal. (The stack image comes from a memory structure that keeps track of which sub-routine called which other sub-routine, and works like a spring-loaded stack of cafeteria trays.) In this image, the best laid plans of mice and men are the bottom layers of the stack, and above them is the intelligence implicit in their bodies and genes, with the topmost goal being the replication of genes that makes up the core of natural selection. It would take a good philosopher to forge bulletproof characterisations of “intelligence”, “goal”, “want”, “try”, “know”, “selfish”, “think”, and so on, that would embrace minds, robots, living bodies, genes and other intelligent systems. (It would take an even better one to figure out how to reintroduce subjective experience into this picture when it comes to human and animal minds.) But the promise that such a characterisation is possible — that we can sensibly apply mentalistic terms to biology without shudder quotes — is one of Dawkins’s legacies. If so, we would have a deep explanation of our own minds, in which parochial activities like our own thinking and wanting would be seen as manifestations of more general and abstract phenomena. “One example is the common tendency to assume that Dawkins’s portrayal of “selfish genes” implies that organisms in general, and people in particular, are ruthlessly egoistic and self-serving. In fact nothing in the selfish-gene view predicts that this should be so. Selfish genes are perfectly compatible with selfless organisms”Isto é explicado muito bem em A Origem da Virtude, de Matt Ridley.Abracos. Concordo com o raciocinio da citação, mas não é esse o meu primeiro problema c/ a metáfora. É que os genes ou complexos de genes não têm outra alternativa que ser obrigados a expressar a sua sequência ou a não a expressar, por mecanismos regulatórios. Embora seja um sistema inteligente, como o Pinker argumenta, não acredito que o genoma tenha consciência ética, pelo que não pode ser ou não ser, egoista. É algo muito humano poder escolher não ser egoista, apesar da tendência inata a sê-lo. A metáfora do Dawkins encerra esta armadilha: a ideia que o egoismo é inato e, portanto, inexorável. É aqui que eu concordo com o Blank Slate, do Pinker. É a ética que nos faz Humanos, apesar da nossa biologia muito humana. Isto é, “…to rise above ourselves…” Portanto, também não concordo que o raciocínio do Ridley se aplique a “organismos em geral”. Abraço. Osame, na verdade a tua citação é do próprio texto do Pinker. Só para concluir, com uma pergunta: existe livre arbítrio nos “organismos em geral” ? Qual seria a estratégia dos genes? Replicar-se, persistir… Mas como? Sendo ESCRAVO do todo (genoma, indivíduo). Nenhum gene pode ter uma estratégia egoista, pois seria o caminho mais rápido para o seu desligamento e extinção. Assim, genes são sempre controlados nessa sua trajectória de replicação. (Uma partícula, com uma determinada trajectória no espaço é egoista?) Um bom exemplo são os milhares de elementos retrovirais (ERVs) desativados que se encontram integrados no genoma humano e do ratinho. Eles integraram-se de forma egoista, por infecção. Mas a sua capacidade infecciosa foi inactivada, e elementos dos genes desses virús puderam persistir, replicar-se. O preço foi não porem em perigo o todo. É claro que se poderia dizer que a estratégia de regulação génica está montada para servir o propósito de sobrevivência do organismo que permitiria a replicação dos genes. Ah, mas chega de teleologia! Dawkins ficou 30 anos mais sábio, finalmente ele achou o gene cooperativo, altruísta. Parabéns ao Dawkins e ao gene.
) pela valoração moral negativa que ela encerra e ii) pela importância desmesurada que atribui ao gene.? n trata-se de opiniões ou afinidades com determinadas ideologias, trata-se da realidade, seja ela negativa ou n, seja ela destruidora ou não até, do sentido da vida.